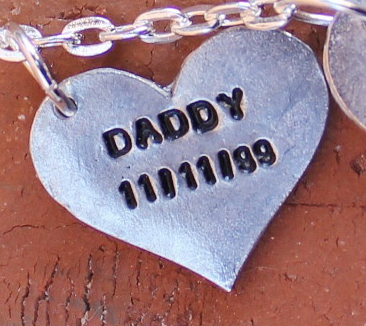 A beautiful chain looped through Infinity with a charm to commemorate the one you loved and lost. The chain is available in Silver Plated Rolo Chain or .925 Pure Silver – Rhodium Plated Chain. The chain is 18 inches long from end to end. - Any other special character will be done at our discretion. - These are hand stamped. We determine what the best placement for the words, capitalization and the size of the font. - Double check all spelling. All text will be spelled as ordered. Misspellings will not be altered from what is ordered even if they are obvious. Click the button below to add the "Your wings were ready but my heart was not" Infinity Necklace with Engraving to your wish list.